No S#!t Trailer: No Activity! CBS All Access’ new series, No Activity, follows two low-level cops who have spent far too much time in a car together; two criminals who are largely kept in the dark; two dispatch workers who haven’t really clicked; and two Mexican tunnelers who are in way too small a space considering they’ve only just met. The series stars Patrick Bramhall and Tim Meadows as the least competent cops since Car 54 Where Are You? – and premieres on Sunday, November 12th. Papa Needs His Daughter’s Tuition Trailer: The House! When parents Will Ferrell and Amy Poehler discover they can’t afford to send their daughter to the college she just got into, they come up with the obvious financial solution: underground casino! The House opens on June 30th. September is for Slapstick: TCM Presents OUCH! A Salute to Slapstick! Beginning September 6th, TCM is presenting OUCH! A Salute to Slapstick – and, in partnership with Ball State University and Canvas Network, offering a free online course in the discipline. OUCH! will explore various forms in slapstick – from The Silent Era to The 1980’s and Beyond; from Charlie Chaplin and Buster Keaton to Will Ferrell and Bob & Doug McKenzie; from the Marx Brothers and Laurel & Hardy to Dean Martin and Jerry Lewis. For details, follow the jump. 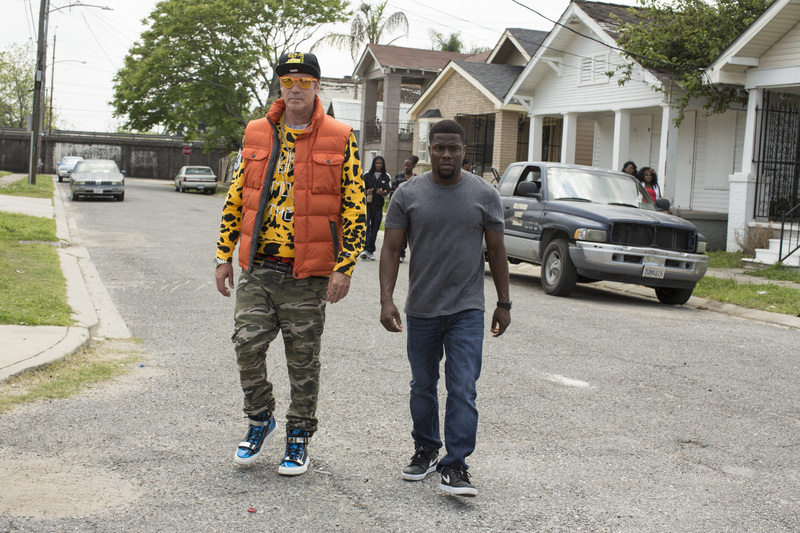 Get Hard – Will Ferrell and Kevin Hart Are The Mutt & Jeff Of Vulgarity! I’m not sure which is funnier – the fact that so many people seem completely unaware that Get Hard is not only not objectionable (at least not for being racist or homophobic), it’s taking the mickey out of racists and homophobes; or that it’s a very funny movie. Happy Halloween From Ron Burgundy! Stay Classy! Not only are the guys from Anchorman back, they are as dim, prejudiced and incompetent as ever. 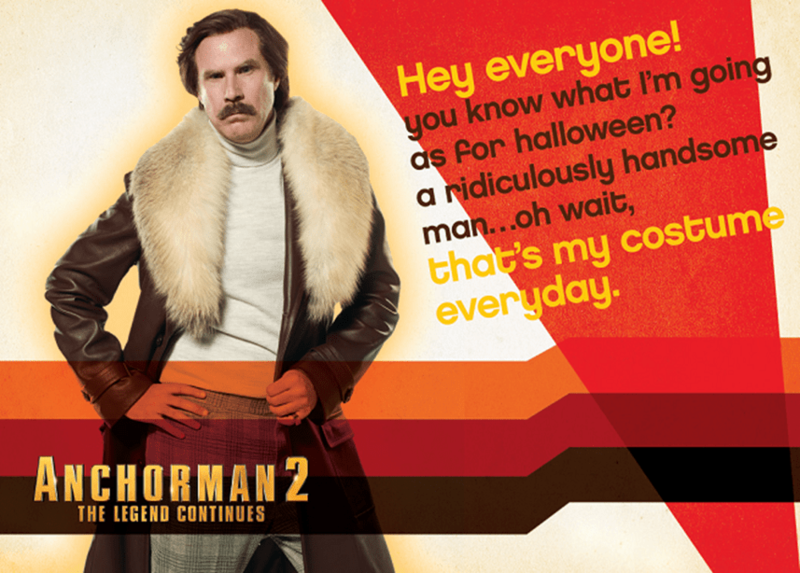 Check out the new trailer for Anchorman 2: The Legend Continues, after the jump. Stay Classy! Would You Buy an SUV From This Guy? 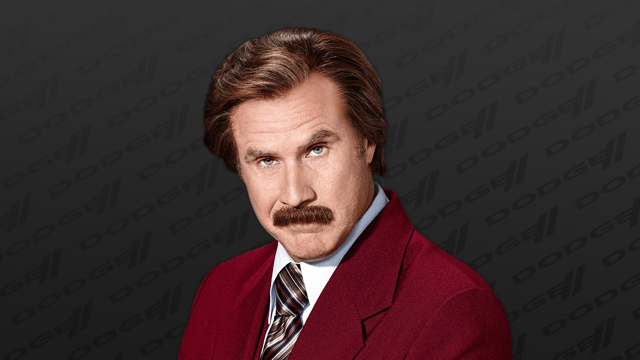 In an unusual move, Anchorman 2: The Legend Continues’ self-absorbed news guy, Ron Burgundy has been enlisted to promote the 2014 Dodge Durango. I’m not sure I see the logic behind that, but it does make for some fun, ‘70s-style commercials. Check out the press release – with link to YouTube videos – after the jump. Anchorman 2: The Legend Continues premieres December 20th. Wait, What? It’s The Anchorman 2 Trailer! Dare I say it? Oh. My. God. Words fail me. 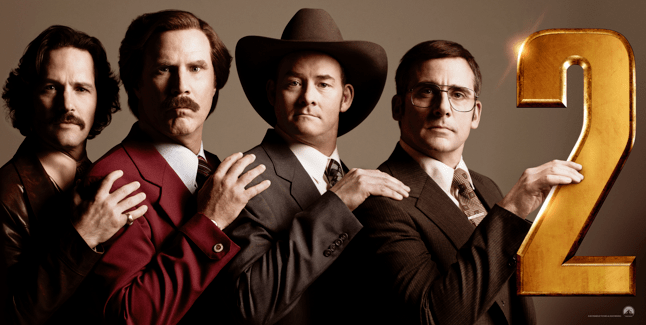 The Anchorman Trailer you are about to see is totally and precisely what it is! Follow the jump and see for yourselves. Megamind Takes The [Bleep] Out Of Superhero Movies–In 3-D! Just when you were beginning to think you couldn’t handle another superhero movie, Dreamworks Animation comes along with a clever, quirky superhero spoof that hits its target spot on. In a deft play on the genre, Megamind answers the question: what would happen if a supervillain actually won? And what happens after that? DreamWorks Animation Presents The First Five Minutes of Megamind! The Other Guys: There’s a New Accountant in Town! It’s taken all of a week for Dinner for Schmucks to be replaced as the funniest movie of the summer, so far – especially because The Other Guys is the unlikeliest of movies – a funny parody of cop/buddy movies. Unlikely because there have been so many in the genre that more than a few have lapsed into self-parody, and the ones that have tried to be funny simply weren’t. Why does The Other Guys work where others have failed? Will Ferrell’s best performance in years; Ferrell’s best material in years and, in Mark Wahlberg, an actor who is absolutely fearless in putting himself out there.